Hack, slash, and smash your way to victory in this Remastered edition of the popular 2D arcade adventure from The Behemoth! 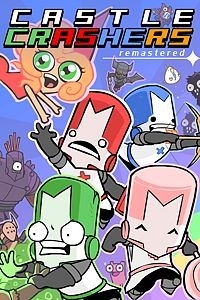 At 60FPS, Castle Crashers Remastered delivers hi-res visuals like nothing you've ever seen before. Up to four friends can play locally or online and save your princess, defend your kingdom, and crash some castles! Back Off Barbarian mini game: Jump and hop across the level to avoid the enemies!